Keeping your generator functioning requires a lot of maintenance, including proper airflow that can be achieved through custom louvers. Your generator is only as good as the maintenance that you perform. It’s an essential device that produces electricity for many uses, and when you need it to be functional, you want to make sure that there are no issues. Periodic or regular generator maintenance will ensure that its functioning properly and safely. 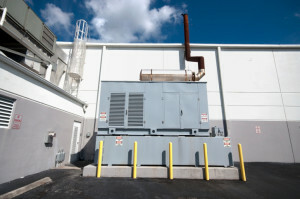 Here are some ways to make sure that your generator is operating properly. The first step in maintaining your generator is to give it a visual inspection. Take note of any spots on it that cause concern. Use your manual to ensure that each of the components of the generator are in the correct position and in good condition. One important thing to remember is to keep the generator off while you are inspecting these components, including the engine oil level. Automatic startup can cause injury while you are checking these elements so to avoid injury, turn the control switch off and disconnect the negative battery cable. A few systems work in conjunction to make the unit work — the exhaust system, the fuel system, and the battery connections. The exhaust system is one area that should be checked for possible leaks and malfunctions. To perform maintenance, shut down the system and repair any leaks that you see before turning the system off again. The fuel system consists of a fuel supply line and fittings. Turn the unit on and, while it’s running, check the line for any leaks in the fuel hose. Do a visual inspection for cuts, cracks, and any abrasions. The fuel line should have enough space around it so that it isn’t rubbing against any other components. If any elements are damaged beyond repair, those should be replaced before operating your generator. The battery connection needs to be tight and clean. If you notice any corrosion or loose connections, these will make starting the generator harder to start when you need to use it. Make sure that the generator is turned off, then disconnect those damaged connections for cleaning or tightening. Use your owner’s manual to reconnect them. In addition to your visual inspection, you should also listen to how the unit sounds while its running. Play close attention to the way that it runs, if it vibrates harder than normal or if it sounds louder than normal. While the generator is off and cool, clean off any debris and dirt from the surface and the control panel. Custom louvers can help you keep airflow at a maximum while reducing debris or dirt. This entry was posted on Thursday, December 7th, 2017	at 12:28 pm	. You can follow any responses to this entry through the RSS 2.0 feed. Both comments and pings are currently closed.